This set of coasters features the famous documents of American democracy. Toast to life, liberty, and the pursuit of the perfect cocktail with this set of coasters featuring the famous documents of American democracy. 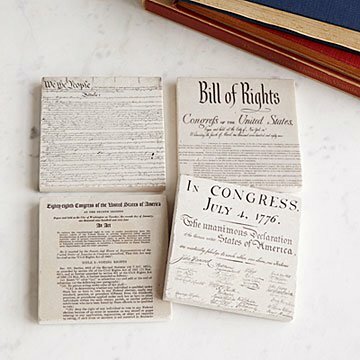 Each of the four tumbled marble coasters showcases selections from a different document—the Declaration of Independence, the Constitution, the Bill of Rights, and the Civil Rights Act—bringing the formula for freedom to your cocktail accouterments. The set makes a great gift for any history buff, teacher, or adherent of the American dream. Complete the set with an iron coaster stand, sold separately. Made in Providence, Rhode Island. Pair your Democracy Coasters - Set of 4 with our Constitution of United States of America Glass and our Declaration of Independence Glass. Perfect gift for Democracy lover. Perfect gift for someone who loves politics and our Democracy. This is a heavy set of stone coasters. The depiction of the historical documents is in its original format. Very classic and a wonderful gift for a historian, veteran, or lover of freedom and America. Bought these as a gift for Christmas; they were very well received. Great gift idea for anyone who enjoys history. They are coasters. Use is obvious. Coaster to be used on a coffee table or at a bar. Good quality. Gave this item as a gift and they loved it. Gave the product as a gift to the best man at our wedding. I gave this as a gift and they loved it. I bought this as a gift, however, I also have a child that is taking criminal justice and she loved these. Everybody loved these at the party. I know that my grandson will be very pleased to received these coasters. I can hardly wait for Christmas when he will open his gift. His eyes will light up immediately and he will say, "Oh, Grandma, these are perfect! Where did you get them?" I loved how each coaster was different and important to giving all Americans their freedoms. A subtle way to geek out about legislation and history while serving a very practical purpose. I was pleasantly surprised at the quality/solid feel of these coasters. I'm not sure how absorbent they will prove over time, but I like the cork underside that should protect surfaces.